InterContinental Hotels Group (IHG) has revealed plans to launch the first InterContinental hotel in Laos. 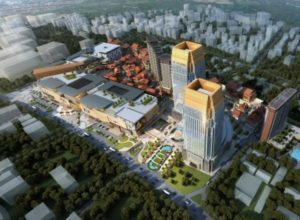 Set to open in 2021, the new-build InterContinental Vientiane will become the company’s second hotel in Southeast Asian country, following the existing Crowne Plaza Vientiane. It will also become one of the Lao capital’s largest hotels, with more than 400 rooms. Built by Lao International Development, the hotel will form part of the new World Trade Centre complex – a mixed-use development that will include a large retail mall, medical centre, conference centre, office tower and residential towers. “Laos is currently one of the region’s fastest growing nations with close to five million international arrivals each year and future infrastructural and industrial developments underway to continue boosting economic growth and attract foreign investment,” explained Leanne Harwood, IHG’s vice president of operations for Southeast Asia & Korea. “It’s a great time to be bringing the InterContinental brand into the country to tap on this potential. “InterContinental Vientiane is… set to be positioned as one of the city’s most prominent hotels which will welcome distinguished guests such as visiting dignitaries and heads of states as key government meetings are planned to take place in the adjoining conference centre,” she added. Among its 400+ rooms, InterContinental Vientiane will feature a range of club rooms and suites which provide access to the hotel’s club lounge. Other facilities will include several F&B outlets, a swimming pool, spa and fitness centre. “It’s an exciting time to be investing in Laos as the country sees improved intra-regional connectivity through the completed Kunming-Vientiane-Bangkok highway connecting China, Laos and Thailand and the upcoming high-speed rail project that will link China to Laos,” said Xiao Long, CEO of Lao International Development. “We are confident these infrastructural developments will boost tourist arrivals, especially from surrounding nations, and the opening of InterContinental Vientiane will cater to the influx of travellers. “We are very pleased to partner IHG to develop what we are confident will be one of the most highly sought-after hotels in Vientiane,” he added. Across Southeast Asia, IHG now operates 14 InterContinental hotels and resorts, with 10 more due to open in the next five years. There are several international hotel brands currently present in Vientiane, including ibis, Best Western and Crowne Plaza, but InterContinental will be one of the first international luxury brands to enter the city.